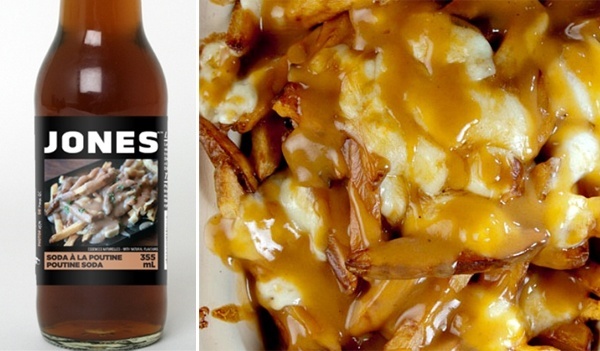 Jones Soda Releases Poutine Flavored Soda | OhGizmo! Poutine is a French Canadian delicacy that involves topping fries with cheese curds and scaldingly hot gravy. The gravy then melts the cheese and creates a dish that’s as delicious as it appears to be artery-clogging. It’s an acquired taste for some, but being (somewhat) French Canadian myself, I can assure you it’s excellent. Now, Jones Soda has released a Poutine flavored soda, which it describes as “a nice balance of rich, savory gravy over a starchy potato base, and accented with those fatty, cheesy notes you expect in a plate of poutine.” They had us at Poutine, and we’re happy to see that it’ll be available in select regions of Canada, including of course Quebec. Jones Soda makes other “special” flavours, such as Turkey and gravy, for Thanksgiving. It doesnt taste like Poutine, and it doesn’t taste good whatsoever. If you want to repel women, and not be bothered by anyone ever again, drink this.